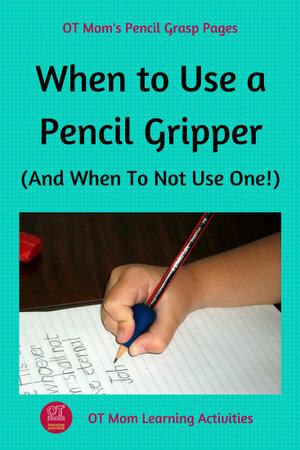 While I believe that pencil grips for kids cannot really improve handwriting on their own, there is a place for using a pencil grip or gripper as part of an overall program to improve a child's handwriting skills. The aim of a "proper" pencil grasp is to be able to hold and use the pencil in such a way that is not tiring, and enables the child to carry out age-appropriate writing tasks with ease. 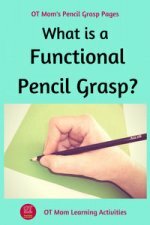 Do pencil grips for kids work? 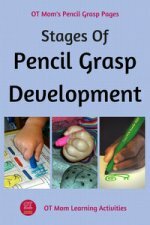 Related pages on pencil grasp development, correct pencil grasp and more! Once a child's fine motor skills have improved through the use of fun activities, I will sometimes make use of a pencil grip to train the fingers to hold the pencil more comfortably. The aim is to get the child to hold the pencil comfortably so the fingers can easily form the letters for smooth handwriting. When the pencil gripper prevents fatigue and enables the child to write more easily, and is not distracting or uncomfortable for the child to use. These cute fish pencil grippers are marketed as "skill trainers" as they assist the child in holding the pencil at a more efficient angle, as well as positioning the fingers on the pencil. They come in 2 sizes (for kids age 3-6, and kids age over 6), which is terrific. They also have grippers specifically for left handed children, which is even more terrific! I like the fact that the child's fingers are so easily placed, and the design of the grip makes it harder for the fingers to "slip out" of position. The design naturally opens up the space between the thumb and index finger and although it tends to favor the index finger being flexed (whereas I think you get more finger movement when the last index finger joint is neutral or slightly extended), I think these are a great choice of pencil grips for kids. This was the first really effective pencil grip I used in therapy and was way better than the "stetro" pencil grips for kids which were the standard issue at the time. In the pictures below, the boy had a rather rigid grasp and was not really comfortable with writing tasks. His fine motor skills had already improved from a very dysfunctional pencil grasp, but I wanted to give him the extra boost with a pencil gripper. He found "The" pencil grip gave him more control over the thin pencil, and he happily used it for a long period after intervention ended. Many children who have used this pencil grip, have commented that it helps their hands feel less tired. A much more comfortable and functional grasp with THE pencil grip! 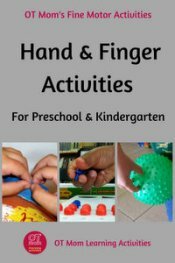 Grips For A "Wrapped Thumb"
If a child has a "wrapped thumb", where the thumb tends to curl over the top of the pencil and/or the index finger, then these two grips may help. Some kids find them really comfortable, and they can help alleviate the "death grip" that some kids display on their pencils! Personally, I do find that these are only effective if given after at least a couple months of hand and finger exercises. 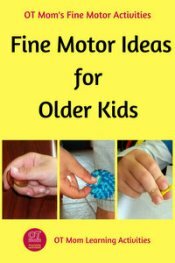 Often, these kids need to do a quick fine motor exercise before a handwriting task. Otherwise, their stubborn fingers just curl over the grip! 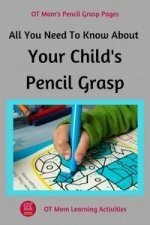 However, if you have been working on fine motor skills, with your child, and feel that he/she just needs a little reminder to hold the pencil more carefully, then these grips can be very useful. They are relatively inexpensive, so it is worth getting them to try out. If you give a pencil grip to kids without working on their fine motor skills, they are likely to just keep using the poor grasp over the pencil gripper! 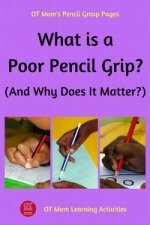 Kids with poor fine motor skills often find pencil grips uncomfortable. When you think about it, most poor pencil grips are a child's way of compensating for a lack of skills elsewhere. 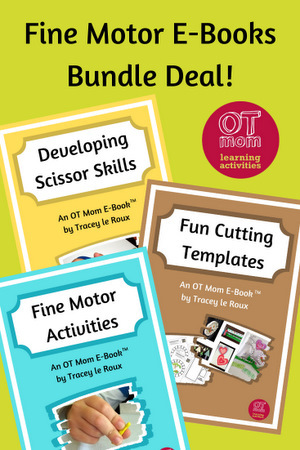 You can read more about the Essential Bases for fine motor development to see if your child needs to work on any other skills first. However, if you are concerned about your child's pencil grip, or if it is interfering with your child's ability to write neatly and efficiently, please request an occupational therapist evaluation! Pencil grips for kids are NOT a substitute for therapy! 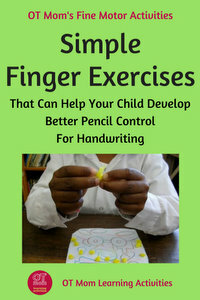 Check out the other pages on my site for more information regarding your child's pencil grasp. 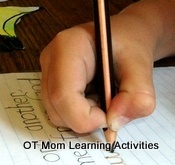 PFOT offer a range of pencil grips and writing aids that may be able to help your child. I hope this article has helped you! Please sign up for my occasional newsletter to keep in touch with new and updated pages on my site!